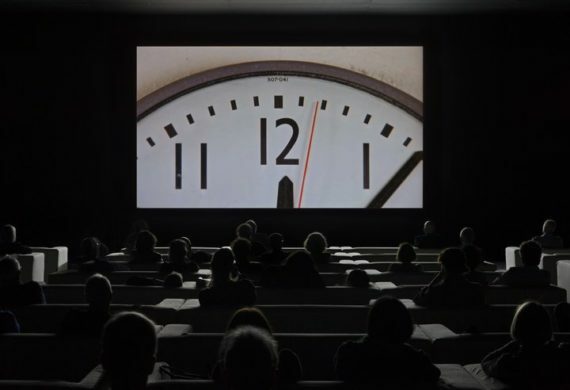 A short reaction to Christian Marclay's 'The Clock' on show at Tate Modern, London, 14 September 2018 – 20 January 2019. A large dark room – a cinema filled with white sofas for relaxing and enjoying the piece in comfort. From its setting in Tate Modern to its witty and accessible content this is enjoyable and pleasure to be in the company of. ‘The clock’ is irresistibly magnetic – dropping in for 10 minutes to ‘tick the box’ you find yourself skipping happily through each one of your arbitrary deadlines to move on through the gallery. It holds you in its thrall and you are happy to be held, continually aware of exactly how long you have been sitting there as the references to time match the gallery local time. A 24 hour film made up of clips relating to or referencing clocks and specific times, a beguilingly simple and accessible concept however a mammoth task which reportedly took 3 years of editing and contains over 10,000 clips. An impressive feat however what makes this truly successful is viewing the witty and engaging narratives that are created. It gives you an easy initial buzz of recognition with famous films and big name actors, but quickly you are drawn in to the various reoccurring films with plot devices unfolding in their real time interwoven with many other simultaneous narratives. Hard boiled heists and thrillers unwind around seemingly everyday lunchtime scenes – world cinema, TV sitcoms, early cinema its all here all bound around its central premise of time. This is undoubtedly a piece for the cinephile and is a fascinating and accessible documentation of cinema however it is more than that, it is a binding of humanity under one thing that rules us all – time. The short stories and narratives that unfold not only entertain but also highlight universal stories and similarities in us all – 1pm unsurprisingly has people eating, scene after scene of different people eating in different ways, unified in the same simple act. You could argue there are some short comings, it is a majority (but not overwhelmingly) English speaking and Hollywood base drawn from, and it is true that famous films and famous actors are used to draw and include the viewer, but this is what gives the piece its great strength it never feels elitist or snobbish but a celebration. World cinema and historic cinema are represented and always interwoven – the obscure next to the blockbuster the scenes are comedic, dramatic, melodramatic and often mundane, but they are always cinematic. The piece celebrates the strengths and rejoices in the medium of cinema and always brings the audience along. I think this is a masterpiece – a mammoth undertaking that is simple in its conception but masterfully, subtly, amusingly and accessibly executed. It unites not only the audience in cinema, but all of humanity. The one thing you will want as you leave is a copy of the clock to use as a timepiece in your own house, although you would never get anything done.